Originally built in 1493 by the Sultan of Bijapur Yusuf Adil Shah, this then was small-fortified outpost when he ruled over Goa. 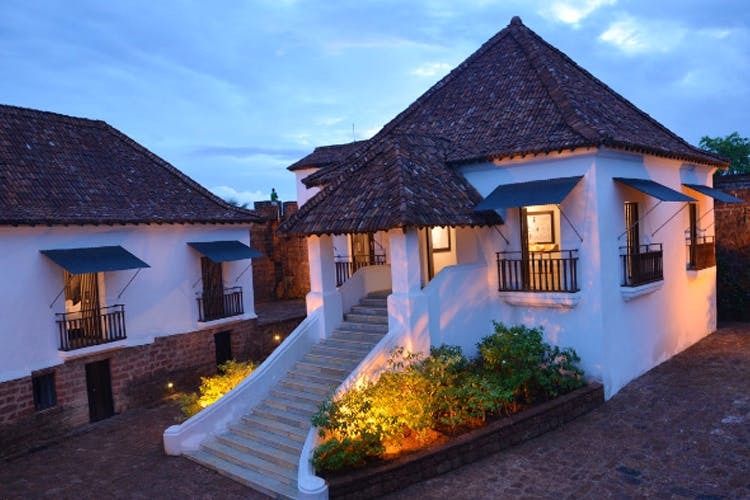 It is the oldest fort in Goa, and has been restored to serve as a Cultural and Heritage Centre. And you can now hold private functions there. From being a Portuguese defence fortress to being a jail to imprison freedom fighters fighting for Goa’s liberation in the 1950s and then a hospital, the Reis Magos fort has served many roles for the state of Goa. The fort has always had strategic importance as the first line of defence for the old port town of Goa which we now know as Old Goa. With panoramic views of Panjim, Nerul, even Old Goa on clear days, this fort is a photographer’s delight. On some days if you are lucky, one can even see dolphins jumping about in the sea. This is an immaculately preserved fort, sparse crowds, well maintained cannons with neat and crisp signage, pictures that educate and entertain. There is a permanent exhibit of Mario Miranda’s sketches, old maps, photographs and drawings of the fort and its history. Also on offer, are amazing vistas of the Mandovi river meeting the Arabian Sea. And one can just visit it and enjoy this beautiful fort, or book it to conduct weddings, private parties, book launches and anything else you can think of. Do carry lots of water and snacks though as currently, it has no refreshment facilities in the fort. The fort is closed on Mondays for general visits and has a small ticket of INR 50 to enter the fort. As there is a steep slope to climb, they also offer a car service to drop you to the top if required.